A poll by YouGov found UKIP’s nationwide support has fallen from 16.75 percent in November to 12.25 percent this month. UKIP’s support has been waning since its popularity peaked when two Conservative MPs defected to the party last fall. Former Tory MPs Douglas Carswell and Mark Reckless triggered by-elections in their constituencies when they decided to switch allegiance to UKIP. Both won their seats back with comfortable majorities, giving UKIP its first MPs in parliament. UKIP’s popularity slump since last November sees its leader Nigel Farage fighting to win the seat of South Thanet after he fell behind the Conservatives in a poll conducted by ComRes. 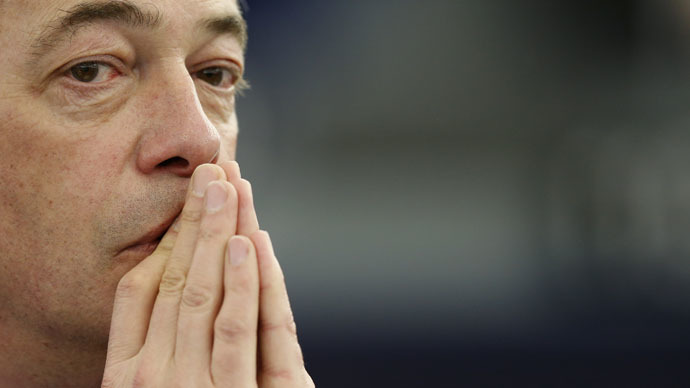 Farage had a 10 percent lead over his rivals in February, according to a Survation poll. He told the BBC last month he would “probably win” South Thanet and would quit as UKIP leader if he fails. Mr Cameron, UKIP voters won't "come home" to Tories or Lab. They've found a more authentic home where they don't get abuse from their hosts. The ComRes poll was not released publicly, but was leaked to the Mail on Sunday over the weekend. Farage’s election woes prompted him to ask UKIP supporters across the country for help in his South Thanet campaign. The UKIP leader posted messages on Twitter and Facebook asking his followers to “please do me a favor” and travel to Kent to campaign on his behalf. He wrote: “I know a lot of you are fighting your own campaigns locally, but if you could spare just one or two days, I’d really appreciate the support. Cameron took advantage of Farage’s waning support to urge disillusioned Tory supporters who have defected to UKIP to return to the Conservatives. Cameron has promised a referendum on Britain’s membership of the EU in 2017 if he is reelected in a bid to defuse UKIP’s threat to Tory seats.